Genuine slate roofing installed by Shiner Roofing, Siding and Windows truly distinguishes a home in Bethesda, Falls Church, or any other community in the Washington, D.C. region. Real slate gives a home a classic look, making a distinctive statement of style and luxury. As a natural stone, slate is considered far more durable than most man-made materials. It also is water- and fire-resistant, and can help reduce energy costs by insulating the home and reflecting harsh sun rays. Shiner has served Northern Virginia, Maryland, and the D.C. Metro area for more than three decades. We are a family-owned and -operated home improvement contractor, and we proudly offer one of the finest genuine slate roofing products on the market: TruSlate® from GAF. 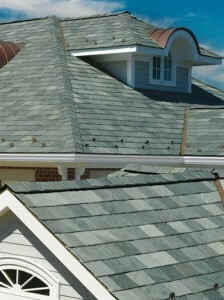 GAF TruSlate® is real, not synthetic, but is less expensive than other kinds of real slate roof. The lower cost is due to the fact that the out-of-sight under half of each slate shard consists of high-tech, weather-proofing material. Shiner Roofing, Siding and Windows has an A-plus rating with the Better Business Bureau and is certified as a GAF Master Elite Contractor. We pride ourselves on providing the best home improvement customer service and workmanship available in Bethesda, Falls Church, Washington, D.C. and elsewhere in Northern Virginia and Maryland. Contact us today to learn more about our fine slate roof products, and how we can help you fulfill your every roofing desire.